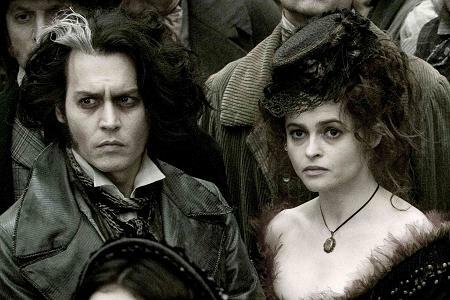 Johnny Depp, Helena Bonham Carter, and Alan Rickman star in a film written by John Logan, based on the play by Stephen Sondheim, and directed by Tim Burton. At times during No Country for Old Men, an oddly elegiac mood asserted itself. You felt curiously like any of the Coen Bros. previous movies could swim suggestively into the frame – a little Blood Simple, a touch of Raising Arizona, followed by smidgens of Fargo. But that only improved the film’s astounding last few minutes and reinforced its overall themes. Sweeney Todd has the same creeping feeling too, with rich hints of The Nightmare Before Christmas, Corpse Bride, Edward Scissorhands, and even Charlie and the Chocolate Factory are all alluded to over the course of this movie adaptation of Stephen Sondheim’s tribute to Brecht and Weill. The only problem? It doesn’t work. In this case, the self-reflexive bits tend to reinforce how frequently boring this supposedly ground-breaking musical slasher flick turned out to be. Don’t get me wrong, there are moments and performances. Alan Rickman, Helena Bonham Carter, and Timothy Sprall – all seemingly on loan from Harry Potter – move with nimble theatrical glee and wickedness. Sasha Baron Cohen is riveting, as is young Ed Sanders as Toby the gin-drinking boy. But Johnny Depp sticks to glowering, mostly because his entire motivation is the simple, hackneyed urge to seek revenge. In 1936’s Sweeney Todd the barber was simply insane. He hacked bodies into meat pies just because he could – it was the kind of frightening ambiguity that the old Tim Burton might have relished in. It surely would’ve made a far richer character for Depp, who’s nearly asleep throughout here – except in the memorable passages where he sings to his razor. But isn’t this artist-who-maims-those-around-him theme there in everything Burton, from Batman to Ed Wood? But what shocks most is the very ordinary production in Burton’s Todd. Perhaps the musical numbers required straightforward staging, but where are those famous expressionistic touches? The old, disturbing splashes of color have been replaced by sheets of stage blood, making even the most gruesome bits seem prosaic after a throat or two is slit. It’s a dark version of Oliver with sharp twists, with musical duets about the joys of cannibalism. It’s just not interesting film. For showtimes, check the Independent‘s movie listings, here.